Remember Cornelius Gallagher, the former chef of Oceana and a Food & Wine Best New Chef (class of 2003)? He left Oceana in 2006 and took a good job at a catering company to start raising funds for his own restaurant. Well, I ran into him recently at an Australian beef luncheon, and he now is corporate chef for a Long Island company called the Bohlsen Restaurant Group, which owns Prime in Huntington, H2O in Smithtown, Tellers in Islip and Beachtree in East Islip. He says they’re now working on opening an Italian place called Verace, in East Islip, slated to open this November or December, and one of those big-box Asian restaurants (you know, like Buddakan, Tao, Buddha Bar etc.) in Babylon, which they hope to open by the end of next year. They haven't picked a name for it yet. The picture in this blog entry is a screen capture from an article I wrote about Neal in 2006. This link ought to work if you’d like to read it. If it doesn’t, let me know. I’ve gone on the record many, many times as basically not being able to watch food TV, not because it’s bad (much of it is, but that’s beside the point) but because I want to turn my brain off when the TV’s on, and if it’s about food I have to pay too much attention. I hate that. Unless it’s Jacques Pépin. I’ll watch Jacques Pépin. I particularly hate cooking competition shows, because to me food is art, not sport. But I might actually tune in to the next season of “The Next Iron Chef,” because on it are a lot of chefs that I like. I don't think that counts. Dominique is a charming French woman who ran an all women's kitchen in Jakara, which is, like, crazy. Here’s a link to an interview I had with her. I just met Jose very briefly a few years ago, when he was chef at a Stephen Starr place called El Vez. He seemed cool and innovative. Jehangir is a brilliant pastry chef and good conversationalist, and Graffiti’s an interesting restaurant, in a good way. Seamus can spin a yarn like no one’s business, and tells good stories about his world travels (here’s a previous blog entry with him in it, in case you’re curious). And I respect anyone who buys whole pigs. Holly Smith does all sorts of interesting things at Cafe Juanita. I haven't interviewed her in awhile, but I remember having a good conversation with her about squab back in 2001. “I like throwing things like truffle oil and foie gras on squab,” says Holly Smith, chef-owner of Cafe Juanita in Kirkland, Wash.
She menued it once on a sweetbread ragoût with fava beans and morels bound in marsala, butter, truffle oil, thyme and sea salt. “My friends would come and order it, but other people would say, ‘I didn’t know you were supposed to have all that stuff on a plate,’” she says. Her squab appetizers sell better, she says, such as the half squab she served with potato gnocchi rolled around an almond-coated date and accompanied by foie gras and a syrup of vin santo. “I think it likes a little sweetness and it also loves a little richness thrown on,” she says. I haven’t met Amanda, Eric or Roberto, but I wish them well anyway. Steakhouses don’t tend to be hotbeds of innovation, not because their chefs and owners lack creativity, but because, for the most part, their guests don’t want them to be innovative. When you go to a steakhouse, generally, you go to eat a steak. It should be delicious. The wine should be red and loud, because a steak can handle it. The chef should cook the steak properly and otherwise stay out of the way. Since my job is to spot trends and to observe innovations, steakhouses are not usually useful places for me to go for work. Unless it's using some new cut of beef or serving it on Himalayan rock salt (like David Burke does) or getting unusually funky with the sides (BLT), there’s not a lot to learn, trendwise, from a steakhouse. So I wondered why I had been booked to eat at the Beachhouse, the Moana Surfrider’s restaurant. I mean, I didn’t resent it. I like steak, I like eating on the beach in Waikiki, letting my mind empty itself of troubles while watching the sunset. That’s all right. But this is my job, after all. I must learn while I dine. I did learn that I was wearing a faux kukui nut lei. 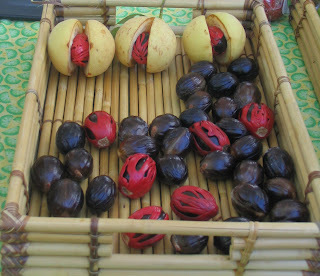 Kukui is what Hawaiians call candle nuts — just like they call passion fruit lilikoi and have to say “mahalo” instead of thank you and “aloha” instead of hello or goodbye. They polish the nuts and string them together into leis. I got one a few years ago when I was on Mau‘i and staying at the Ka‘anapali Beach Hotel, as a guest of that island’s visitors bureau, so I thought something was amiss when I was handed one at the Royal Hawaiian and it didn’t weigh anything. Because kukui nuts have some heft. I wasn’t sure it was okay for me to wear a lei. Did Hawaiians actually do it, or would I look like a touristy idiot? I’d actually asked my taxi driver about it the night before on the way to dinner at Chef Mavro (yes, I have a rented car, and I already knew how to get there even without the GPS, but I planned on having wine with dinner, and it is bad form for food writers to get DUIs). He was a Vietnamese fellow who had been in Hawaii for a number of years. He said leis made of kukui nuts or seashells were sort of like neckties, to be worn by men as a way of dressing up. Flower leis were for women, he said. But in Mau‘i I had been greeted on my arrival with a nice-smelling tuberose lei. “Welcome to Mau‘i. Please sign here to confirm that you have received your lei greeting,” said the woman who draped it around my neck, proffering her clipboard. It kind of dampened the effect, but I appreciated the gesture anyway. I won’t say I was disappointed that I wasn’t adorned with a nice smelling lei when I arrived in O‘ahu, because that’s really looking a gift horse in the mouth, but, well, here I am mentioning it. The Mau‘i bureau also rented me a Mustang convertible. It was a different economic time, I know, I’m just saying. Anyway, I had my faux-kukui nut lei in my pocket in the taxi on the way to Chef Mavro. When the taxi driver said it was okay to wear, I put it on. I asked my dining companion, Mavro’s wife Donna, if it was okay to wear, and she confirmed that it was in fact a good accessory. My server at the Beachhouse also said it was fine for me to wear it, but asked if perhaps those were faux kukui nuts. And there was something interesting and trendy at Beachhouse: the wine list. They’d just revamped it, clearly with the economy in mind, offering bottles to people who might want some wine with their steak but not if they were going to have to sell a kidney to pay for a bottle. One way to do that is to stack the list with what people in the wine business call "fighting varietals,” wines that are just a step or two pricewise from jug wines and make up the bulk of the wine market. Often they’re brands big enough to advertise on television. You’ve heard of them all, and so has everyone else, and so they have a certain appeal for people who want wine without fussing about it. I think there should be more wines like that. But instead the folks at Beachhouse stacked their list with relatively obscure wines that, because of their obscurity, aren’t in such high demand and so they can buy them cheaply. I asked them to pick a couple with the food I ate, so I had a 2007 Domaine la Bauvade Côtes du Rhône (a red one), with my Kona lobster bisque with crème fraîche and green onion crouton. And with my Moyer Farms 20-ounce rib eye, I had a 2006 (red, obviously) Clos la Coutale from Cahors, in Southwestern France. I also had a Mau‘i onion and hamakua mushroom sauté that wasn’t your typical steakhouse fair either. To view all the blog entries about my trip to O‘ahu, click here. Fine dining is all well and good, but it doesn’t give you a complete picture of what a community has to offer when it comes to food. And although, in my limited experience, Honolulu’s fine dining restaurants manage to refract Hawaiian culture through their unique prism, the city’s more down-to-earth restaurants really show the city's culinary character. 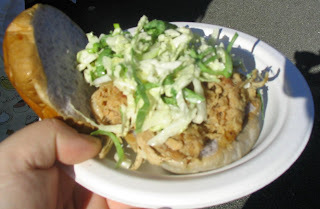 In an earlier entry I mentioned the magical pork adobo plate lunch that I had at Pee Wee Drive In. Steve was following my Twitter updates and insisted (in a Direct Message, indicating his sense of its importance) that I try the place. 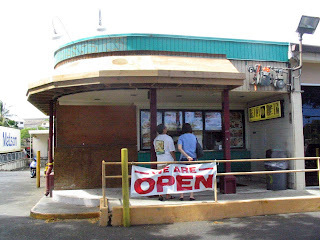 @HIwrite said other recommendations I’d received were “tried + true”: Helena's, Rainbow Drive-In (for loco moco) and Diamond Head Market. @honoluluacademy asked me to visit it's Pavilion Café. But instead I followed the advice of my friends, and had Soon's Kal Bi kalbi plate lunch. To reiterate what a plate lunch is, it’s any sort of protein served, often in a segmented TV-dinner-style tray, with two scoops of rice and macaroni salad. But at Soon’s, instead of serving macaroni salad, they served a sort of mixed kimchi, with a bunch of pickled vegetables all combined together and to be eaten with the grilled short ribs and rice. It was all very tasty, although I'm no expert on kalbi, and I realized as I ate it that I couldn’t find similar food in New York (or at least, I hadn't). The next day I checked out my friend Jonathan Ray’s recommendation for Thai food: Mekong 2, where, on his recommendation, I ordered the Evil Jungle Prince plate lunch. And there, along with the two scoops of rice, was green papaya salad. The style of service that wasn’t the restaurant’s only adjustment to locals’ tastes. The curry itself was similar to a Thai massaman curry, but it definitely had a certain brown-gravy quality that reminded me very much of loco moco, which is basically salisbury steak on rice with brown gravy, topped with a sunny-side-up egg. I had it at a food court for breakfast. I might be over-interpreting the San Francisco Chronicle’s lede in its story about Nate Appleman quitting his job “[j]ust two months after nabbing the national James Beard Foundation award for Rising Star Chef.” But to me it sounds a tiny bit accusatory, like you’re not supposed to quit a job after winning an award there. But it’s not an uncommon practice. Of the past ten chefs to win the Rising Star award, including young Mr. Appleman (he has to be young, you have to be aged 30 or younger to win the award), four have left their jobs within a year or so. Grant Achatz won the award in 2003 for his work at Trio in Evanston, Ill., and soon left to work on Alinea in Chicago, which opened the following year. Allison Vines-Rushing quit Jack’s Luxury Oyster Bar in New York about a year after winning the award in 2004. She moved to Louisiana and opened Longbranch. 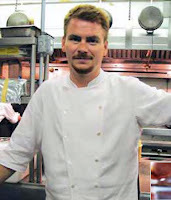 Christopher Lee was named Rising Star at Striped Bass in Philadelphia in 2005. He became chef of Gilt in New York in 2006. David Chang was named Rising Star in 2007. Being an entrepreneur, he couldn’t quit his own restaurant, but no doubt that award, and the nine quadrillion others that he’s received, have helped him to expand his empire. There’s no shame in it. Poor Jennifer Watson! She’s smart, talented and interesting, yet she thought she was unable to perform the simple task of reading my blog. Because she knew I was having dinner with her at Aureole, and yet according to my blog, I was still in Hawaii. In fact, I got back from The Aloha State weeks ago and still haven’t finished writing about it (that Aloha State link will take you to all of my blog entries about that trip — current and future). Jennifer sells defibrillators and pacemakers to cardiologists, but she doesn’t just sell them. She goes into the operating rooms with the cardiologists and observes their procedures. She also entertains her cardiologists, of course, and she loves, loves, loves food and drink. So it’s fun to eat out with her, not just because of her good company and appreciation of the meal, but because she often knows people working in the restaurant. Anyway it seems that a lot of people who used to work for Daniel have found jobs at the new Aureole. There’s nothing scandalous about that. Restaurant workers move around a lot as opportunities present themselves, and it makes sense for them to see different styles of cooking, management and service. So just as Aureole’s kitchen is heavily spiced with staff from Oceana and Gilt, which are two of executive chef Chris Lee's last three jobs (after Oceana and before Gilt, he was at Striped Bass in Philadelphia), the front-of-the-house has hostesses, managers and wine people from Daniel’s restaurants. They greeted Jennifer with warmth, and they were nice to me, too. Chris started us off with the corn soup, and he personally brought out a middle course of Alaska halibut. Jennifer thought that was especially cool. 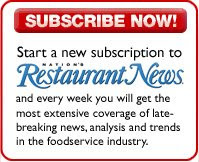 Did you know that CBS News Productions was the production company for The Next Food Network Star? You learn something new every day. CBS Eye Too Productions is seeking two-person teams for a new restaurant competition show. The Skills to Run a Restaurant: Are you a pro in the kitchen while your teammate is a star in the front of the house? Are either of you a restaurant manager, waiter, host, chef, weekend gourmet, line cook, sous chef, designer, business person? Combined do you make the perfect team to run a restaurant? Personality that Pops: Are you and your teammate charismatic and outgoing? We’re looking for lots of energy and charm! If you can’t make it to the open call and still want to apply, please e-mail us at restaurantshow@yahoo.com. Please include your names, ages, locations, occupations, contact phone numbers, a recent photograph of yourselves, and a brief summary as to why your team is perfect for the show! Oh, I have so much to share with you, dear reader, but I have some fires to put out today, and so in the meantime, please enjoy this interview with the chef at Chez Roux, Albert Roux's new restaurant outside of Houston. And while I'm at it, in case you missed it, my story on the cuisine of Puglia. Let me discuss again why I am not a restaurant critic and don’t recommend restaurants to my readers (although I did just express delight at the deliciousness of my lunchtime baby octopus). Saturday night dinner during my visit to O‘ahu (two weeks ago, I know) was at Chef Mavro, where I dined with the chef's wife, Donna Jung, and was given a grand tasting menu that I shall detail in a moment. As far as I could tell, everyone was getting great service, but it’s hard to tell when you’re eating with the chef’s wife, when the chef is in the kitchen, at the very least looking after every plate that comes your way, and later coming out to chat. Often when chefs come out to chat they’re very polite but rather standoffish, but given the fact that we’d spent the previous day at the harbor, trudging through a watercress farm and eating malasadas, that would have been weird. And I don’t think it’s Mavro’s style. So he just plopped into a spare chair (because when you’re me — or one of hundreds or possibly thousands of people like me — even when there’s just two people dining, you’re usually seated at a four-top) and hung out for awhile after the main dinner rush had ended. During dessert, Mavro commented on one of the trendiest flavors going these days. “Maple is a magic flavor,” he said. Like Vanilla or lilikoi (which is what Hawaiians call passion fruit; they can't help themselves) it adds an ineffable flavor that you can't necessarily itentify, but you know that it’s delicious. I’d put nutmeg in that category, too, but you’ll start to think I’m obsessed with the spice. We ended up closing the place down and Mavro gave me a ride back to the Royal Hawaiian in his Lotus, and I really, really should have taken a picture of my inelegant exit from that low-slung vehicle, just to show you how self-deprecating I can be. More pictures of nutmeg, and my trip to the north shore. Boy, Hawaiians sure get up early. Or maybe farmers do, I don’t know, but my second morning in Hawaii I had a 7:45 a.m. appointment with Dean Okimoto, one of the founders of the Kapi‘olani Community College Farmers Market. My directions for getting there were so easy that I didn’t even turn on the GPS, and in fact it was very easy to find, the only surprise being how far away I had to park at 7:30 in the morning. The place was packed. I strolled around the market a bit and took pictures of nutmeg, as you can see in the first picture. 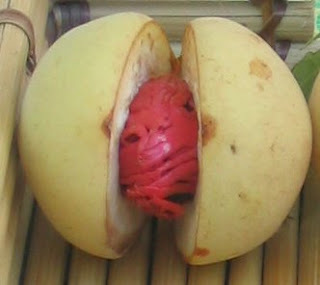 The second picture is just a detail from the first picture, because about a third of this blog’s readers are New Yorkers, and they’ve probably never seen a nutmeg fruit before. Other than the nutmeg and a couple of other somewhat exotic fruits such as soursop — and mango and papaya if you count them — and the fact that the weather was more perfect than at most farmers markets, it was pretty much a farmers market. Dean explained that the inspiration for the venture came from time he spent in San Francisco. And indeed, it did have a sort of Bay Area vibe somehow, and lots of temperate-climate vegetables. Those are new crops in Hawaii, Dean explained, driven in part by chefs who want to use more local produce, and by farmers who have been priced out of the pineapple and sugar cane markets by lower production costs elsewhere in the tropics (everywhere in the tropics, I would think, except maybe Singapore). Dean himself is the head of Nalo Farms, which specializes in salad greens (indeed, I’d had some the night before at Orchids). I asked if it was a challenge to grow lettuce that wasn’t bitter, as the tropical sun tends to do that to lettuce, and he said that, indeed, it was, and in the summer they had to harvest the greens at a younger age than at other times of the year. I snacked around a bit — a little pulled pork sandwich made by the culinary school students, some curry musubi, a bit of roasted corn. There was a lot of prepared food at the farmers market, which I guess is okay, but Dean said they had 60 merchants at the market and a waiting list of 40 more who wanted to display their wares. I'd think I'd want to give priority to the farmers who are selling their own stuff, but I’ve never tried to run a farmers market, so maybe I don’t know what I’m talking about. Then it was time to check out of the Halekulani and move about a block over the the Royal Hawaiian, a procedure that, given the one-way streets and the fact that neither the GPS nor I were sure, exactly, what little unmarked side alley we were supposed to drive down to find the hotel, took about half an hour. In fact, I tried at first to check into the Sheraton Waikiki, which is considerably less upscale than the Halekulani (or, as it turns out, the Royal Hawaiian). Sheraton owns the Royal Hawaiian, too, so the receptionists, even while managing a patient herd of tourists standing in line, were able to direct me to my proper hotel. “The pink one,” one of them said. The Royal Hawaiian is, indeed, pink. And there's no typical front desk there at which to check in. Instead there are several fairly opulent desks. You are supposed to sit down at one end, across from the uniformed hotel employee who will help you while you sip a light, refreshing beverage presented to you as you sit down. It’s very civilized. But it being 10:30 a.m., my room wasn’t ready. No matter, as I was driving to the north shore anyway to have lunch at a seaside place called Ola. “Turn right on [brief pause] *ee *oy street,” the GPS said. “On where?" I asked it as I found myself in the wrong lane to turn onto Piikoi Street. The GPS isn’t very good at pronouncing those hard voiced consonants, but it does provide an interactive map, and its verbal instructions are also written on the screen. “Recalculating.” said the GPS and she started pointing me to the airport. But no, we headed north and without too much fuss ended up at the Turtle Bay Resort. Ola looks like a touristy seafood shack that sells fried clams, calamari and, if you’re lucky, cold beer. But instead I had a tuna poke salad, and baby octopus with orechiette pasta in a coconut milk sauce that might have had just a whiff of curry. I was kind of shocked by its deliciousness. North Shore Limu, onion, Inamona, Kahuku sea asparagus, sesame soy. Orechiette pasta, spinach, Maui onion, roasted pepper, citrus, lemon grass herb oil, crab luau cream. Oh, and the chef is Fred De Angelo. 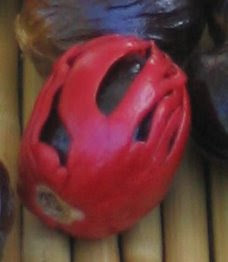 This is a picture of a fresh nutmeg. That thin partial layer of reddish stuff around it is the spice mace. I guess physiologically it is to nutmeg what the paper-like layer around a peanut is to the peanut. That’s all you get from me today, but tomorrow the story of my trip to O‘ahu and my passive-aggressive relationship with the GPS will continue.